IAFF: Local 4342. 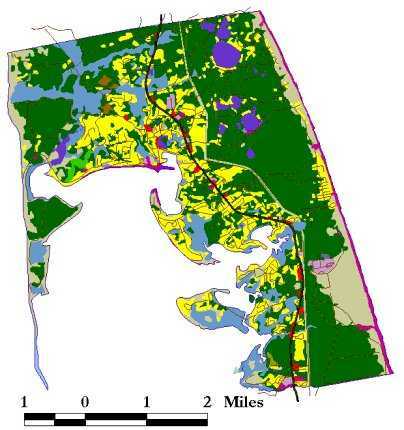 Wellfleet Personnel are civilian. Minimum of 2 per shift. BSO - Barnstable County Sheriff's Office - Wellfleet Fire Dispatcher - Since Mar 2012. Previously by Wellfleet Police-Fire Dispatchers. 911 Secondary: N/A - BSO Dispatches Wellfleet Fire Rescue. There were some references to fire apparatus in Wellfleet prior to the official acceptance of Ch.48 in 1934. Back in Feb 1875, there is mention of a committee planning specs for Town Hall to procure all necessary info regarding hooks, ladders, the chemical engine and extinguishers. Another reference in 1879 mentions procuring such fire apparatus, ladders, ropes, axes, etc along with a shelter for same. A similar reference is made in 1882, so perhaps these articles failed in town meetings or follow-up to same. In 1911, $500 was authorized for purchase of fire apparatus. In 1912, there was an article for$1000 for the purchase of fire apparatus - this may have been for the forest fire warden. A fire tower was built in town in 1928. In 1932, the fire warden's report states the fire apparatus is now obsolete and should be replaced by modern forest fire fighting equipment. There was also some reference to the fire station in 1932 with a vote to extend and enlarge the facilities. That station was on Commercial Street, opposite Bank Street. There was a Model T forest fire truck with a small pump and tank prior to the establishment of the department. A 1929 American LaFrance pumper (Engine 1) was also bought in town before the department was officially organized. It had a 500 gpm pump and only an 80 gallon tank, but it could pump a stream over the Congregational Church at draft. It remained in service until about 1959. The Wellfleet Fire Department was officially established February 12, 1934 with the acceptance of Ch.48, sections 42, 44, and 45 of general laws. A Board of Engineers was appointed with Dr. C.J. Bell, Cyril Downs, Edward B. Lane, Fred Howard, Benjamin Paine, and Clarence Hicks. From that group, Edward Lane was appointed as Chief, Fred Howard 1st Asst Deputy, and Cyril Downs 2nd Asst Deputy. The board of Engineers found the equipment lacking. A siren was donated to the department. In 1935, there were 19 brush and grass calls, including one 14-1/2 acre fire at which the town 'moth sprayer' was utilized. The report for 1935 reports the pump was overhauled and now produces 3 streams, where before it only produced one. Of the original 1200' of hose, 200' was condemned. The department had 15 members. A tank truck was bought in 1935. It had about a 1000 gallon tank on a Ford chassis. The separate forest fire department retired its Model T in 1939 and bought a 1939 forest fire truck that served until the forest fire department and fire department merged in 1950. The fire station was expanded to 3 bays in 1938-39. A 1946 Chevy (engine 2) was bought and became the first due engine with a 500 gpm pump and a water tank. Truck later known as 92. A 1955 Dodge pumper was bought as Engine 3 (93) with 1000 gallons. In 1958, a Ford/Maxim 750 gpm pumper was bought for Engine 4 (94). In 1974, another Ford/Maxim was bought for Engine 5 (95). The Wellfleet rescue squad was established in the 1950s. Lower Cape Ambulance served Wellfleet as well from about 1954 to 1960. The LCA was in Truro. Wellfleet got its first ambulance, a retired military Cadillac from Fort Drum, NY. A "good body" from another 1953 Cadillac was refitted onto the military chassis by members of the department. A Panel Truck rescue truck was purchased from CD in 1957-58 and carried some equipment. New Fire Headquarters 10 Lawrence Road opened March 2009..
1934 - July 19 - Chequesett Inn Fire. 1960 - March - Wellfleet Town Hall Fire during a blizzard. 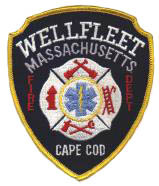 The Fire Radio Call Sign...............WQBB 922............."Wellfleet Fire"
The Police Dispatch ID..................KCA 370..............."Wellfleet Police"